Mung recipe collection. 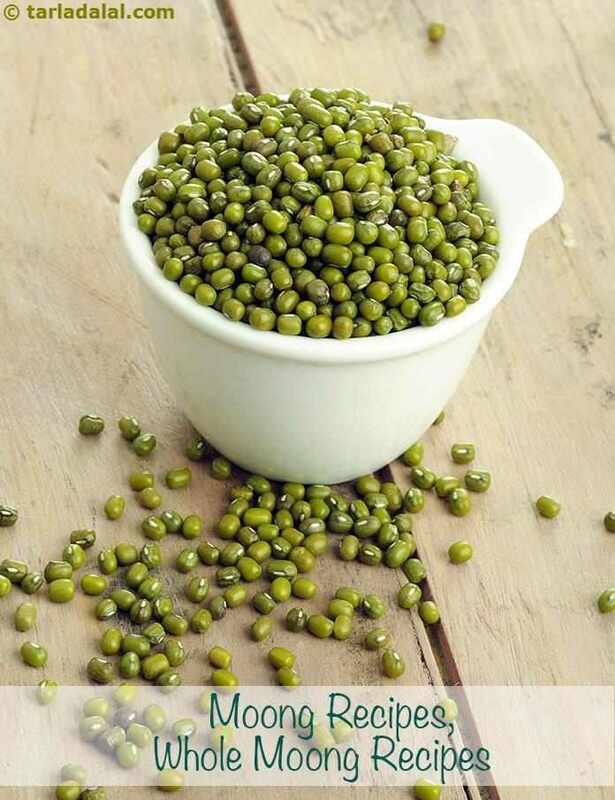 Moong, also called Mung or whole green gram, is a type of legume that grows predominantly in Southeast Asia, especially India, and hence is a very big part of the Indian cuisine and food practices. It is used in many different ways whether boiled, sprouted, raw or mashed and in many different varieties of dishes like salads, soups and of course, subzis. Moong beans can either be cooked by boiling them in a pot of water or by pressure cooking them. They also have to be soaked for at least 2-3 hours before cooking them. Due to the versatility and availability of the bean in south and Southeast Asia, it is a staple in almost every household. Hence such a wide variety of moong recipes are available. There is a variety of snacks that can be made with whole moong that can even be fun for the kids to eat. Add boiled moong to a mix of boiled aloo, some cheese, masalas and toast it between breads, then you have yourself a delicious Cheese AlooMoong Toast, made within a few minutes and with just a little planning ahead. If and when you're craving your favorite aloo tikki but don’t want to eat unhealthy, go for the Moong Sprouts and Spring Onion Tikki as the perfect replacement. They are easy to make moong recipe and packed with flavors of spring onion and garlic which make them the perfect snack, healthy AND tasty! There is a time in every parent's life where their kids refuse to eat healthy food. The trick is to make the food appear delicious looking so that they eat it. Methi and Moong Sprouts Wrap does exactly that. Instead of serving the food as plain roti-subzi, the subzi is rolled in rotis so it is fun to eat. Moong can also be used to make the all-time favorite Gujarati snack, dhoklas. Sprouts dhoklas are a vibrant green in color and truly shows the versatility of this bean. Other very innovative moong recipes include using moong in Pav Bhaji. With loads of veggies, sprouts and the ever favorite pav bhaji masala, this is our new favorite recipe for pav bhaji! Moong is also one of the main ingredients in the street food special, Misal Pav, along with white peas and chawli beans. Speaking of street food, another very famous dish found in Maharashtra is Moong Chaat, where sprouted moong is sautéed with spices, onions and tomatoes and served hot. One of the most famous dishes of the south is Pesarattu, is a dosa made with whole moong and flavored with ginger, onion and green chillies and cooked on tava till crisp. You can even make a variation in this and make a Stuffed Moong Sprouts Dosa. In case you are craving something with rice, you can always whip up a Moong Khichdi or a Sprouted Moong Methi Pulao. As an Indian, dal is an essential in our household like every other Indian home. There are a lot of moong recipes that make use of moong in dal form. Dals made with moong are healthy and flavorful and are definitely enjoyed by all. Whether it is the Panchratni Dal, which as the name suggests is made with 5 different types of pulses or just Moong Dal with Spinach, it is always a crowd pleaser. If not dal, there are a few soups you can make as well like the Moong Soup with Paneer, a simple concoction of boiled, blended and strained moong with paneer or a Garlicky Moong Sprouts Soup with Spinach. There are a lot of subzis that can be made with whole moong. If you want something Gujarati, Mixed Kathol, a subzi made with various Pulses, is the way to go or if you want a classic, there is always Sukha Moong, a dry subzi with only moong and spices. For a more Maharashtrian dish, there is Matha Chi Bhaji, a subzi made with moong and flavorful amaranth leaves. Another exotic way to eat moong is to eat it as a korma which is spiced up with tangy tomatoes and a cashew paste in a recipe called Moong Sprouts Korma. Another very scrumptious recipe is Sprouted Green Gram Ghassi, which is a Mangalorean curry, has a rustic taste and flavored with coconut and onions. We hope you enjoy our Moong Recipes Collection of 200 recipes.